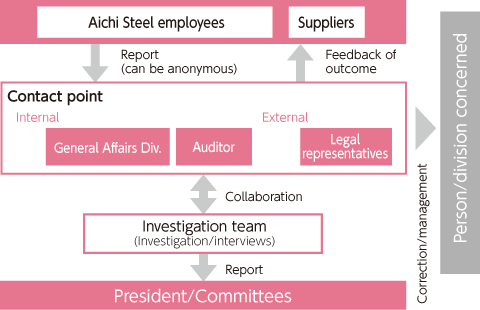 The Aichi Steel Group states in the Aichi Steel Group Action Guidelines that it will comply with domestic and foreign laws and regulations both in letter and in spirit, and that it will respect human rights, and sets out behavioral standards for this. Through level-based training and other educational opportunities, we cultivate a corporate culture in which the diversity of each employee is respected. Workplace study sessions are held with the goal of preventing workplace harassment, and a “Hotto (hot)” line is in place for use by employees with issues regarding human rights. This system enables employees to consult directly with advising legal representatives. We distribute workplace management handbooks to share examples of harassment and information on the states of mind that each party can often occur with. Using the harassment examples, session participants discuss problematic behaviors and areas that supervisors should be aware of. Going forward, we will continue to use this workplace management handbook for ongoing training. In addition to basic matters regarding employment prescribed by law or in collective labor agreements, Aichi Steel has set forth its Rules of Employment, with the goal of establishing fair labor conditions and maintaining order in the workplace. We clarify and implement recruiting standards in conformity with the Equal Employment Opportunity Law, the Corporate Code of Conduct set forth by the Japan Economic Federation, and the Aichi Steel Group Action Guidelines. A variety of activities are promoted in which labor and management work together to create a working environment that is friendlier to workers and helps enrich their lives. Beginning in fiscal 2015, proactive efforts are underway to prevent health hazards due to overwork and to ensure the physical and mental health of employees through the promotion of work-life balance. These include efforts to reduce total working hours through the establishment of a labor-management review committee charged with reducing overtime hours and encouraging employees to use paid leave.